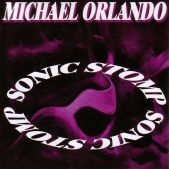 Today I will be reviewing this fine album by Michael Orlando entitled ”Sonic Stomp”. Well I can tell you that this album is pretty darn amazing both technically and musically blending styles together to create a monster of a rock shred album. The shredding blends in really well with the music, being used when needed, creating tension and excitement and all sorts of chaos sounding mayhem, but Orlando has a bucket load of melody in his songs which are also used right and it makes for a very enjoyable listen. 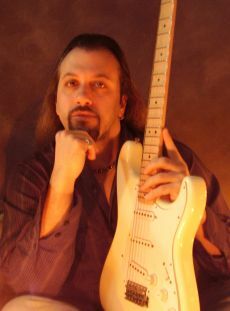 There are a few great, emotional ballads on here as well, which give your mind a little relaxation in between all of the heavy crazy shred mayhem (that’s if you need it! ), and they are really very well done. I enjoy all the tracks on this album but I’d have to say my personal favourite out of the bunch is the opening track ”Wheels In Motion” – now if you love your 80’s melodic hard rock, this ones a treat for you – amazing harmonies and melodies and just a great vibe from the song will have you air guitaring all over your room in no time. 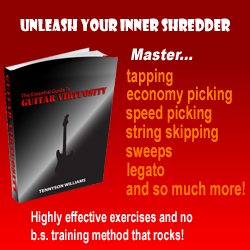 This is definitely a recommended album from shredaholic.com, if you like the sound of what I’ve said above or like shred music in general check this CD out, you most probably won’t be disappointed.